To speak of Chinese food in one simple category means as little as lumping together Italian, English, Swedish and Greek food as "European." It may prove convenient when we scan for restaurants in the phone book, but it ignores the dynamics of regional tastes and ingredients. "Chinese food" ranges from the hearty hot pots of the Mongolian steps to the savory-sweet dim sum of cosmopolitan Hong Kong, from the creamy fresh fish of Shanghai to the smokey sliced meats of Szechuan. Chinese food in America has squeezed through the funnels of immigration, adaptation, and homogenization, yet it often manages to reassert its proud heritage as one of the world's greatest and oldest classical cuisines. The food at Cafe Yulong has many of the hallmarks of Chinese culinary classicism. It reflects the sophisticated lightness of Mandarin cuisine, with hints of Szechuan, Hunan and even Korean influences. This food communicates in a soft clear palate of flavors, tempered with balance, transparency, delicacy and freshness. 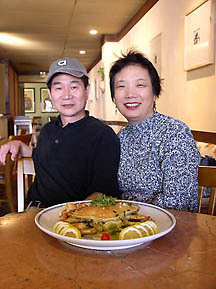 The husband and wife owners of Cafe Yulong, James and Miya Pei, came to this country 30 years ago from Shandong province in northern China, across from the Korean peninsula. They have lived in several cities since then - Des Moines, Chicago, La Jolla - owning a restaurant in each new town. Luckily for us, they relocated to Mountain View this year, and leased an empty restaurant on Dana Street downtown. Miya Pei runs the business up front with calm poise and a genuine smile, while James heads the kitchen in back. He proudly showed us his spotless new kitchen, where I noticed a distinct absence of bottled sauces or canned ingredients. Carefully skimmed light chicken stock was setting up for the next day. Crisp vegetables and fresh herbs filled the fridge, and a pasta machine sat ready to roll noodles from fresh dough. My wife and I first visited Cafe Yulong for a late afternoon snack. As we read the menu, we sipped oolong tea and nibbled on the complementary fresh kim chi (Korean style spicy pickled cabbage), which greeted us every time we visited. We noticed the menu category "Fresh Housemade Noodles," so we decided to split a heaping bowl of Tan Tan Noodles ($5.95). Some restaurants drown this dish in heavy peanut sauce. Cafe Yulong's rendition surprised us with its finely minced topping of ground pork, green onions, mushrooms and water chestnuts, with a smattering of crushed peanuts in a delicious light chicken stock. The wheat-based noodles tasted fresh indeed, with a firm feel in the mouth and not a trace of stickiness. We definitely wanted to return for a full meal. Arriving for dinner the following week, we ran into two different parties of food-loving friends, who had spontaneously decided to try the newly opened restaurant. It seems word travels fast among local foodies. We quizzed our friends about their favorite dishes, and the friendly restaurant staff suggested some of their own favorites from the menu. The environment felt convivial, relaxed and comfortable. We ordered two appetizers and three main dishes to share. The appetizers came quickly, first the crab ragoon ($4.95), crispy triangles of fried flour wrappers filled with cream cheese, with whispers of king crab, onion and garlic. I was expecting more crab and less cream, but they tasted mild and delicious nevertheless. For our second appetizer we shared a whopping plate of 12 pork dumplings ($5.00), as big as pot stickers, filled with a brightly flavored blend of ground pork, green onions, ginger and cabbage. A triple compote with mustard, sweet-sour and soy sauces accompanied the dumplings. I felt that a lighter sauce might have flattered these dumplings better, but they were delicious on their own. I look forward to trying each of the many different house dumplings, especially the Yulong fish and leek dumplings ($5.95) which sounded delicious. Our first main course, the spicy lemon pepper prawns ($10.95) awakend our senses. The succulent shelled prawns had been cooked so lightly they were still translucent, tossed quickly in a wok with onions and scallions, fresh shiitake mushrooms (called "dong gu" in China), thin lemon wedges and a lightly peppered broth. In each bite, I could sense the elusive fragrance of wok "hay", the smokey perfume imparted to food when seared in a smoldering well-cured wok. The pearly lemon-pepper sauce highlighted these smokey smells while balancing the natural textures of each fresh ingredient. I noticed this balance in all of the stir-fried dishes that I tasted at Cafe Yulong, including the Ghan Shao lamb ($10.95). The thin slices of lamb carried not a hint of muttony flavors, but lingered light on the palate with warm Mandarin spices and fresh shredded scallion. Tiny strips of carrot and red bell peppers added freshness to the subtly sweet sauce, tinted with soy and black pepper. Highlighting our meal, the Sichuan tea smoked duck ($10.95) made us hum with delight. Sectioned into chunks, the moist and tender meat had been marinated overnight in five-spice, steamed for several hours, flash-smoked with burning tea leaves, then toasted again before serving. Usually we avoid eating the fatty duck skin; but this crisp skin was so surprisingly lean, and it held so much smokey flavor, that by the end of our long meal nothing remained but a few small bones. For desert we tried the glacé bananas and apples ($4.50 each), one of the few deserts in traditional Chinese cuisine. Batter-fried and coated with caramilized sugar and sesame, then dipped in ice water at our table to form a crunchy shell, the fruit was molten hot and meltingly sweet. We loved it, but we couldn't finish after the large dinner portions. The beer and wine list is short and simple, but very affordable. Tsing Tao and other imported beers cost only $3/bottle, domestics only $2.75. Wines ranged from $3-$7 by the glass, $11-$26 by the bottle. Cafe Yulong's one-page lunch menu covered a well chosen subset of the long dinner menu, with lower prices and single serving presentation. This could become a favorite lunch spot with its huge bowls of fresh noodles and generous plates starting at $4.95, accompanied by the house-made kim chi, bowl of hot & sour soup, and rice. The Chinese black mushrooms and baby bok choy ($4.95) tasted clean, fresh and lightly smokey. I could tell from the crackled mushroom caps and soft slippery texture that the chef used very high grade fresh fungus. The spicy Chao Ma noodle soup ($5.95) came in a large bowl stacked with fresh wok-seared shrimp, mussels, squid, cloud ear fungus, cabbage and more. The light red spicy chicken broth was redolent with smokiness from blackened Szechuan peppers, whose seeds had been removed to soften their heat. Yum. Don't let Cafe Yulong's familiar-sounding menu and reasonable prices trick you into thinking it's "just another Chinese restaurant." Cafe Yulong stands out from the crowd with its fresh clean flavors and feathery sauces. This food feels healthy and comfortable. I could eat here every day.